There’s nothing wrong with the world of hot-and-fast searing. But sometimes it pays off to take the heat down a few notches and enter the world of low-and-slow smoking. After all, there’s nothing quite like the way a brisket melts in your mouth or a pork shoulder falls apart under your fork. You aren’t a true grill master until you’ve experienced cooking like this. 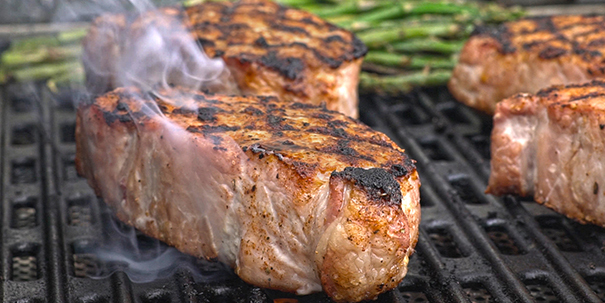 Here are a few of our best tips for when the grill temp is low and the expectations are high. It’s called “low and slow” for a good reason. Many recipes require at least 4 hours, while some call for up to 14 hours of smoking. You’ll save yourself a great many headaches if you give yourself plenty of time to cook. Meals like these aren’t meant for a hard deadline. The last thing you want during a long cook is to run out of fuel. If that happens, your pellet grill will go into shutdown mode, and you’ll need to spend at least 10 minutes feeding pellets back into the auger and burn cup. Luckily, this is easily prevented. Just lift your hopper lid and double check how many pellets you have in there. Depending on how large your grill is, you can estimate to burn between ½ lb. and 1 lb. of pellets per hour of smoking on a low temperature (below 250° F, including Lo Smoke and Hi Smoke). Keep in mind that cold weather conditions may raise the rate of pellet consumption a bit. This is a primary rule for any type of grilling or barbecuing. Make sure your grill has come to temp before starting your meat. At a low temperature, this should take about 10 minutes. If it’s cold outside, it might take a little longer to preheat. Consider using a pellet grill blanket on your grill to keep the temp stable in difficult weather. You’ve probably heard the saying, “If you’re looking, you aren’t cooking.” In other words, when you peek at your food by lifting the lid, the heat escapes the grill, and your temp won’t hold as steady. Our Smart Smoke Technology allows the temperature to fluctuate slightly for maximum smoke output, but it still helps to keep the lid closed as often as possible. Make your first hour count when you’re dealing with slow-cook meats. It’s in the first hour or so that your food will absorb most of its smoky flavor and take on its smoke ring. To increase the amount of smoke your meat absorbs, start with a piece of meat that is below room temperature. We also recommend mopping or spritzing the meat throughout the cook to keep the surface moist (moisture attracts smoke particles). For large cuts of meat like brisket and pork shoulder, you’ll want to maintain a low cooking temperature throughout the entire process, between 210° F and 250° F. However, some cuts may benefit from the reverse-sear method—starting low and finishing high. Thick-cut steaks, pork chops, chicken, and even potatoes taste great via this method. Cooking at a lower temp to start gives you even color throughout the meat; finishing with high, direct heat gives you the great texture and taste of a perfect sear. The color of smoke changes based on the size of its particles and how much light they absorb and reflect. The only thing you really need to know is that blue, almost clear smoke is what you want for your slow smoked meat. Blue smoke has the smallest particles and reflects the most light; and more importantly, it offers the best flavor. White smoke is most likely what you’ll see when your grill is just firing up or feeding more pellets, as it is maintaining the temp. Black smoke is what you get when your fire is starving for oxygen. You can help control which type of smoke your fire produces by opening the chimney on your grill. The more oxygen, the better. 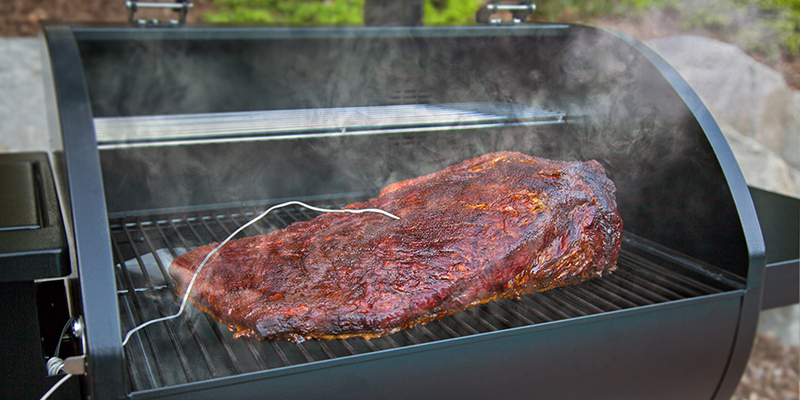 If you’re brand new to grilling and smoking, the dark, mahogany color you see on a finished brisket can be dismaying. After all those hours of cooking, you burned a perfectly good piece of meat? Wrong! That dark color is exactly what you want to see when you’re cooking low and slow. The “bark” on the outside of your meat comes partly from the heat, partly from whatever rub you used, and partly from the smoke particles sticking to the meat’s surface. Show your bark proudly, and enjoy its incredible crunch and flavor. Do you have other great tips for cooking low and slow with your pellet grill? Share your grill master knowledge with the Camp Chef family in the comments below! Then check out our pellet grill line up to get started on your own slow-smoking cookout. I just bought my Campchef pellet grill and really forward to smoking and grilling on it. Definitely! Take pictures and let us know how it turns out for you!